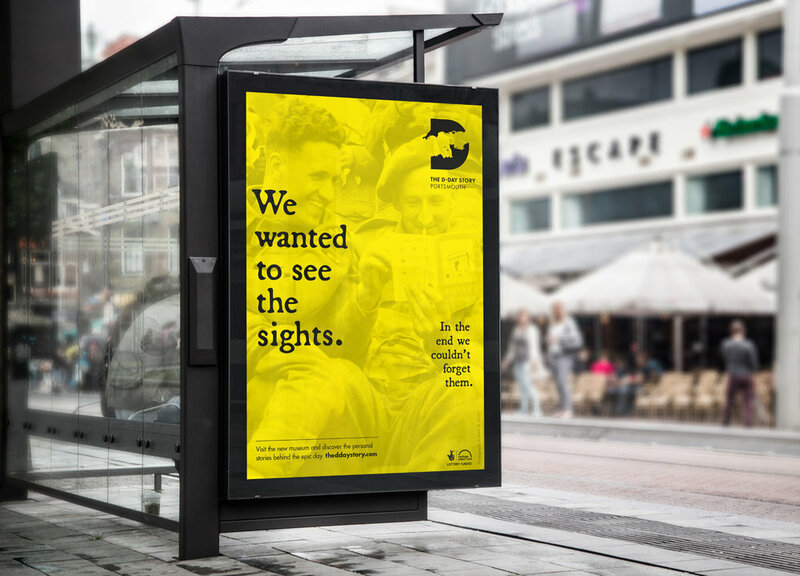 We worked with Portsmouth City Council to rebrand the D-Day Museum – moving expectations from a strictly ‘military’ museum, to an experience rich in personal stories. This new positioning widens the appeal – making sure the D-Day Story is shared for years to come. Our Associate, brand strategist Scott Sherrard worked with everyone from veterans to volunteers, and councillors to students, to find out what the D-Day Story meant to them. The resulting brand is built on juxtaposition – the epic operation, the personal experiences, the darkness of war, the light relief. We shone a huge spotlight on the individuals who were part of D-Day – making their stories epic; and zoomed right in on the unfathomably huge operation – making it personal. We created a brand positioning, identity and guidelines, then developed a marketing campaign and onsite wayfinding and signage. Despite the free entry age being cut from 13 to 5, and two free entry days being cut from the calendar (which accounted for 5% of 2015 visitors).